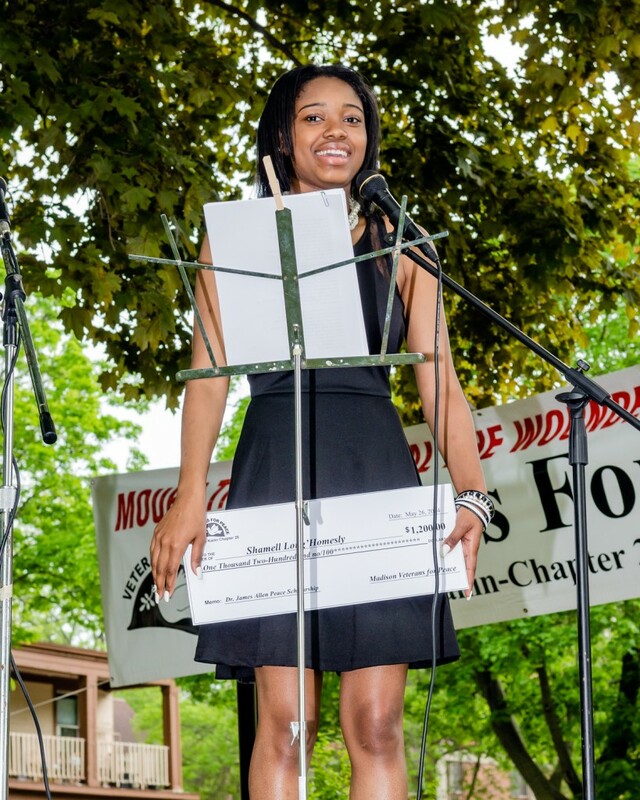 Shamell Long’Homesly of Malcom Shabazz City High School is the winner of the 2014 James Allen Memorial Peace Scholarship, shown here accepting the award at Ch. 25’s Memorial Day Event at James Madison Park. 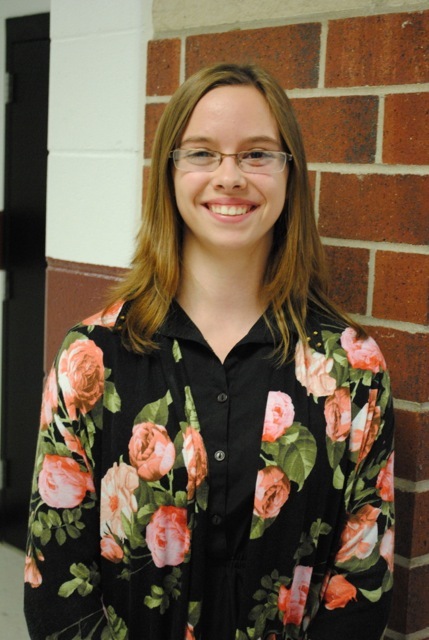 Shamell wrote a winning essay entitled “Why War Isn’t the Answer” and will receive $1,200 to attend Madison Area Technical College (Madison College) starting this fall. She intends to enroll in a two-year liberal arts program to earn an associate’s degree, then transfer to a 4-year college to complete her bachelor’s degree in education. Her goal is to be a teacher. Her strong letters of reference credit her with a broad array of activities and responsibilities, from family life to working while attending school. During the summers she has worked for the Madison School and Community Recreation (MSCR) program as a program leader. Chapter 25 has awarded $1,200 peace scholarships to a Madison high school senior every year since 2009. This year’s challenge question drew a record number of applicants. The scholarship opportunity was opened to all Madison public schools to attract this number of applicants. Previous years focused on a single school. Having touched all five high schools, the decision was made by the scholarship committee to make it a city-wide challenge in 2014. Shabazz and Memorial high schools led all schools with applications. Believing that many students opt for military service because they cannot afford the cost of post-high school education, Madison Veterans for Peace decided in 2009 to establish several scholarships to encourage post-high school training and study. Through generous contributions from both our members and community supporters, VFP is focuses not only on Madison schools but also smaller rural schools, including Richland Center, Dodgeville, Spring Green, Boscobel and Muscoda. In recent years at several of the rural high schools, 10-15 percent of the graduating seniors have written powerful essays on the topic “Why I Believe War Is Not the Answer.” David Giffey works tirelessly to inform students in these districts, encourage applications, and award scholarships each May. The program was named the James Allen Memorial Peace Scholarship to honor the late Dr. Jim Allen, a long-time VFP member and generous supporter and friend to all he met. Dr. Allen, a talented ophthalmologist who practiced at the Madison Veterans Administration and University of Wisconsin hospitals, died in 2011. 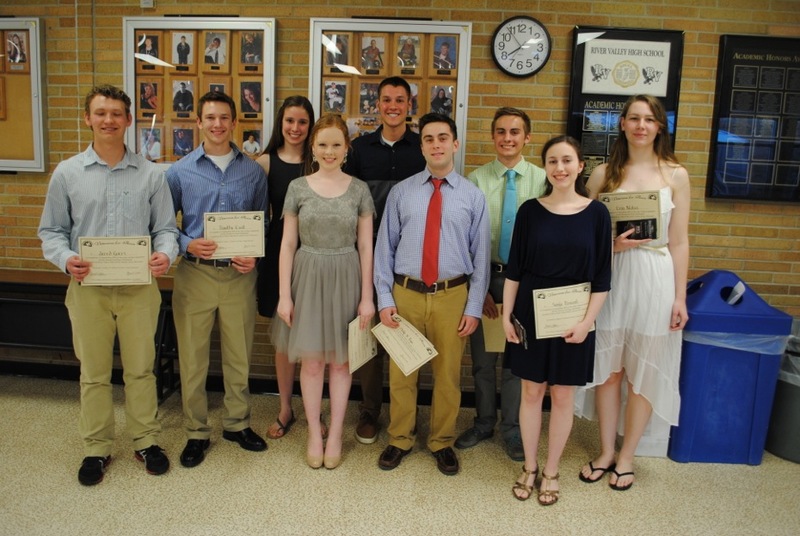 Nine members of the Class of 2014 at River Valley High School, Spring Green, wrote essays on the subject “Why I Believe War Is Not the Answer” in the Chapter 25 Veterans for Peace essay contest. They represent 12 percent of the graduating class. This record number of applicants came during the seventh year Chapter 25 has awarded a scholarship at the school. Because of the notable response and the high quality of the essays, two scholarships of $500 each were awarded. Second place writers received certificates of appreciation and high quality chocolate bars for their worthy efforts. Pictured, left to right: Jared Goers, Timothy Knoll, Lauren Drachenberg, Madeline Ehlinger, scholarship recipients Cody Diehl and Philip Pape, Payton Scallon, Sonja Passant, and Erin Nolan. Chapter 25 also awarded scholarships in Dodgeville, Boscobel, Muscoda, and Richland Center high schools in rural southwestern Wisconsin. Read Philip Pape’s essay here.